The Asian Pacific Student Association at UC Irvine’s 4th Annual Talent-Art Benefit Show | ACYD: Always Chase Your Dreams is a multimedia showcase in which Asian Pacific-Islander (API) students attending UC Irvine will have the chance to demonstrate their talents while competing for first place. Our goal is to provide a supportive and empowering environment for both the competitors, rising stars, and audience members by emphasizing the importance of community, recognizing injustices against API people and People of Color, and providing ways to address these issues. Furthermore, ACYD is a benefit show. We plan to partner with Sessions LA (http://www.sessionsla.com/), a music writing, production, recording, & DJing program for youth and young adults in Los Angeles at the Searching to Involve Pilipino Americans (SIPA) office. Session LA’s mission is to promote youth development, nurture critical thinking, and foster community building through the process of creating music. The event is free to attend but we recommend a $5 donation. 100% of the proceeds will go towards Sessions LA in support their youth program. 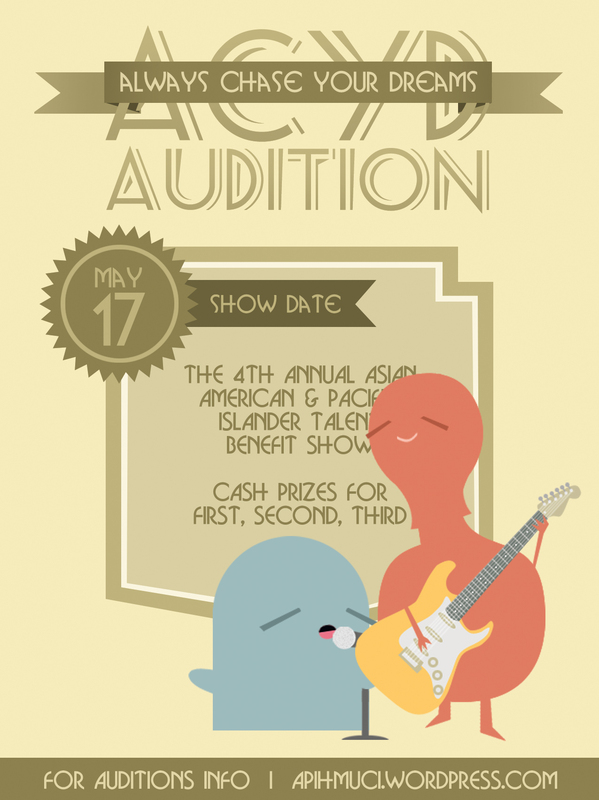 ACYD will take place on May 17, 2013, Friday, at UC Irvine’s Student Terrace from 7PM – 9PM. Please turn in your application as early as possible so that we can ensure the fluidity of auditions. ← The 2013 APSA Top 30 Search Starts!